Representatives from some of the nation’s top social universities gathered at a Google+ Hangout recently to share experiences, best practices and kick off the second year of Barnes & Noble College’s partnership with the Shorty Awards. The Shorty’s celebrate excellence in all forms of social media and Senior Supervising Producer, Natan Edelsburg, introduced the Hangout this way. “It’s back-to-school season, and in honor of our second year of working with Barnes & Noble College, we wanted to get together some of the brightest and most interesting minds in this space to tell us a bit more about what it’s like to be working in the trenches of social media at their colleges and universities.” The Google+ Hangout, which resembles a hosted video-web chat and where all guests can participate, certainly offered up a wealth of information with the media experts providing a strong barometer of how social media is being used in higher education. 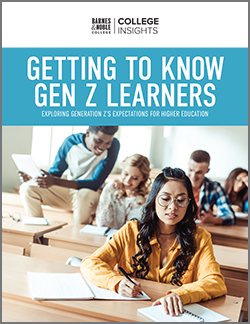 The Back-to-School theme resonated with all of the participants and although some channels can be quieter during the summer months, many took that opportunity to strategize for the fall. 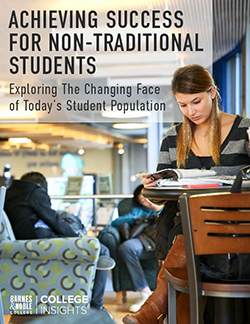 “Our returning students have exceptional energy,” said Terra McBride, Director of Media and Social PR at Pennsylvania’s Point Park University. “And we wanted to use that energy to figure out how we can be part of the conversation.” One application was to build a social component to the school’s Pioneer Experience orientation program, where students were invited to share their first campus pictures under the #AdventureU hashtag, a program so successful it will likely be repeated for future open-house events. Orientation is a good fit for social media, as Sarah Gould, Communications Specialist from West Virginia University, and last year’s Shorty winner in the Barnes & Noble College sponsored category, can attest. “We reached out to students before school even started, using Twitter and Instagram to ask alumni for advice on things they wished they’d known as freshmen and tips for our incoming students,” she said. Social media can also be used in support of a range of other college activities. Ryan Whittington, Assistant Director of PR and Social Strategy at the University of Mississippi, pointed out the important role sports play on his campus. “The engagement numbers really pick up once the football season starts, and we’re trying to capitalize on that momentum in contests with our sports apparel providers,” he said. The medium, as much as the message, is key to engaging students, and the panel was invited to name the favored platforms at their colleges and the success of newer mediums such as Tumblr and Snapchat. Jason Boucher, Social Media Director at the University of New Hampshire pointed out. “Photos work best for us, so Twitter and Instagram are used the most,” he said. “And now, Instagram includes comments and questions – so we’re adding 100 new followers a week.” Whittington agreed on the importance of Instagram, but added that the instant video feature was particularly popular on his Ole Miss campus. “Those little 15-second shorts get talked about and Tweeted – it’s definitely up and coming,” he said. The technical nature of students at the Massachusetts Institute of Technology led Stephanie Hatch, Social Media Marketing Specialist for MIT, to add social network Quora, a question-and-answer website created, edited and organized by its community of users, to the list. “You’ll notice on Quora there’s a lot of tech and knowledge – and that’s exactly where MIT is,” she said. All of the experts agreed that the social media mainstay, Facebook, is still a significant force on campus, but resonates more strongly with alumni, community members and international followers. When it comes to social trends specific to the higher education space, the panel discussed everything from migration to mobile platforms to the emergence in popularity of newer programs such as Vine. Harvard’s Digital Content Strategist Mike Petroff, however, tempered the surge of available platforms with the need for targeting. “I think people are scaling back; they’re thinking about how specific content or a conversation or a specific target group can be repurposed more effectively – whether it’s LinkedIn for alumni, or Twitter and Instagram for current and perspective students,” he pointed out. Point Park’s McBride agreed. “You have to communicate in a way that resonates with your audience, you always need to be thinking about ways to deliver content in a new and fresh way for an audience that expects to receive it differently,” she said. The breadth of views and strategies discussed on the Shorty’s Hangout were no surprise to Barnes & Noble College’s Consumer & New Media Marketing Manager, Tamara Vostok, who co-hosted the event. “Our first year in support of the Shorty Awards was about wanting to get our campus partners involved, and to celebrate and recognize all the great work they do in social media,” she explained. “This year, I think we’re really going to see an influx of entries, and we really want to put the focus on activation – putting together some great ideas for our stores to get the students involved to support their school,” she added. 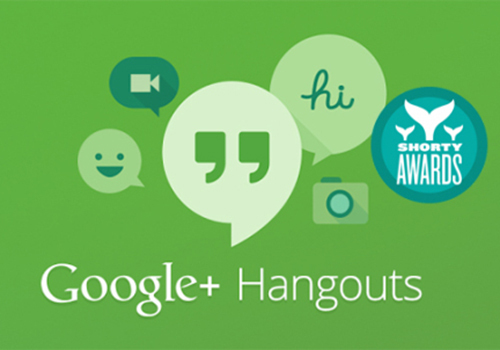 The Google+ Hangout was the first of many initiatives lined up for the year leading up to the 6th Annual Shorty Awards to be held in New York City in March.